Come on out to the Green Section (by the tents) and slide enjoy some inflatable entertainment! 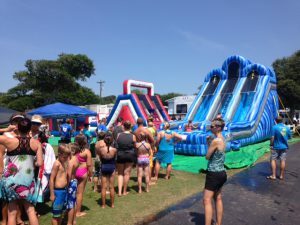 We’ll have a 40′ dual slide, and and obstacle course for you to challenge your family and friends! We’ll have the water hooked up, so bring your bathing suits and come out to beat the heat! As you can see, last time was a big hit!